“End of an era!” Jani Lange called out as he headed west on Pier Avenue last Friday night. 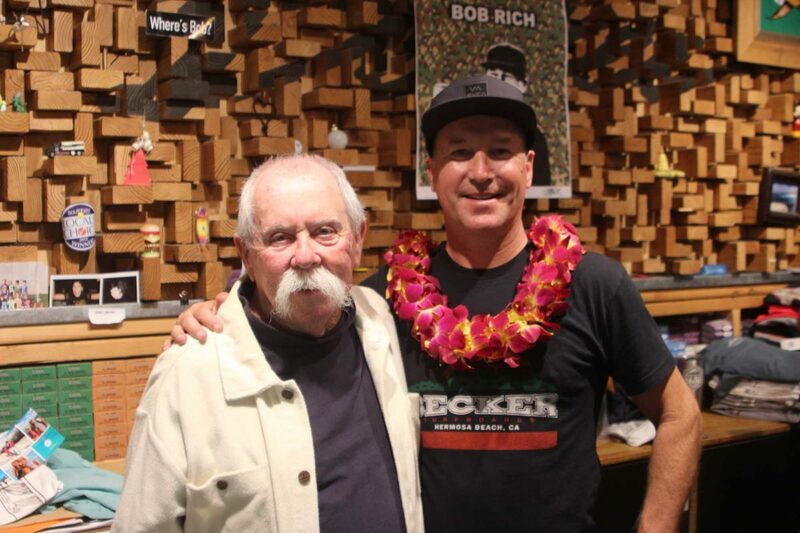 Lange and his family were bound for Becker Surfboards, which was throwing a party to commemorate the last day of Bob Rich, the store’s manager who had been with the company for almost 33 years. Rich began his time at Becker as a “shop grom” who hung out at the store with his friends. Becker co-founder Dave Hollander would give him the occasional t-shirt as payment for odd jobs. When a vacancy popped up and the store needed someone to work, Rich was there to raise his hand. “Eventually when they needed someone to work, they said, ‘Hey you already know what’s going on here. Do you want to work here? We could use some help.’ That’s the cool thing about being in the community,” Rich said. Despite his lengthy tenure with the company, Rich was given just two weeks notice. He does not have another job lined up, but is considering several different fields. “My position got eliminated. Which is a bummer, but time goes by, and I learned a lot of things. I’m ready for the next chapter of my life,” he said. Through a spokesperson, Boardriders said it did not comment on personnel matters. There are no plans to close the Hermosa store, the spokesperson said. Rich’s tenure with the company coincided with the dizzying rise and inglorious fall of the surf apparel industry. In the 1990s, Rip Curl, Billabong and other brands enjoyed huge margins as the world learned to dress like surfers. Stores benefitted too, and Becker at one point expanded to seven locations. But the Great Recession, changing fashion trends, and the rise of online shopping forced significant cutbacks. In 2010, Billabong bought the Becker brand. Rich said that this coincided with increased cost cutting and consolidation. Last year, Billabong itself was purchased by Boardriders, Inc. in a deal orchestrated by Oaktree Capital Management, the brand’s largest shareholder. Today, Becker is down to just two stores: the Hermosa original, and a Malibu location. Kira Lingman has worked at Becker for 10 years, and was hired by Rich. A friend named Sam was already working at the shop, and she described a hiring process with the same tight-knit feel as when Rich came aboard. “I was really nervous about getting a job. But Bob said, Oh, you’re friends with Sam? You seem cool enough,” Lingman said. For many employees, Rich was a perfect boss. “You went to work knowing that you were going to have a good time. You were not going to be able to slack off, but Bob made working there fun. So many people who worked there felt like it was one of the best jobs they’ve ever had,” she said. Rich said that the job became more challenging as online sales became more popular. In recent years, he often saw people come in to the store and take pictures of items, then leave, likely to purchase them online. And while he often heard people lament the disappearance of local stores, keeping them, he said, will require real commitment from people to shop where they live; without that, he fears community institutions are going to vanish. Hermosa resident Jose Bacallao is a loyal Becker customer. He, along with his wife and daughters, often stopped by the store just to talk with Rich, or offer him vegetables from their garden. Connection with the community was Rich’s greatest strength, he said, and will be sorely missed. “You’d walk in there, and no matter what he was doing, he would stop, say Hi, and give a kid a hug. I hope Bob really feels that that’s what he represented. He did for us and for so many people,” Bacallao said.